As a former Track Athlete I can tell you that the “Pre-season” is crucial to your performances on the track when it counts. I view the year in two parts. The time spent training & competing (season) and the time spent preparing for competition (Pre- Season). A typical Track & Field Season will last from April-July, sometimes at the professional level the season will extend into August. The season could be even longer if we include Indoor Track & Field. This Indoor season runs from December-March.No matter the length of the season an appropriate Pre-Season plan is a must for optimal performance. The workouts in the Pre-Season should be primarily base building workouts that will give the athlete the strength, stamina and confidence to complete the more intense and skill specific work that will be the primary focus during the racing season. Longer, slower intervals are appropriate at this phase. Longer and slower than the peak speed work which will follow in the next phase, for a 100meter runner perhaps this include sets of 200meter repeats at 60-70% speed. 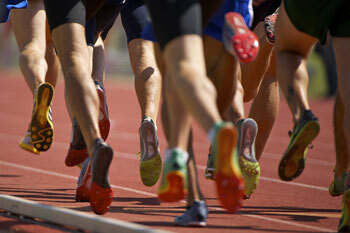 A 400meter runner might do 300meter repeats at 60-70% and a few sets of 600meter repeats at 50-60%. The volume and speed of these workouts will vary from event to individual. The aim at this phase is strength, conditioning and physical preparation to build upon. Track & Field is a tough sport. The athletes suffer muscle strains, aches and overuse injuries, all largely due to volumes and intensity that the body is unable to handle. Strength training should be a part of a year round training program but in the pre-season the greatest strength gains can be made. This is because much of the racing season's focus should be on the specific track workouts and necessary skills (ie: starts, form etc). The athlete gets stronger in the pre-season and focuses on maintaining strength during the season. Circuit training is widely used due to the efficiency of time it offers. This also offers the distinct advantage of keeping the Heart Rate elevated while strength training, this offers a double bonus of building strength and possibly improving the athletes Cardiovascular system. If an athlete has had a history of injury, this is the time of year to focus some strength training on that area. For example if a sprinter has a history of hamstring pulls or strains, they can consult with an Athletic Trainer or Physical Therapist to check for muscular imbalances or perhaps strength discrepancies. If such an issue is discovered an appropriate strengthening program can be designed. The pre-season not only offers the opportunity to improve the athlete's strength but to help minimize the athlete's limitations. I've never finished a run and thought, "that was a waste of time." Frank Pucher is a former 2x All-Conference Distance Runner and NCAA XC Qualifier for East Stroudsburg University. A 6x Boston Marathon Qualifier, he owns a Sub-3hr PR in the Marathon and a ½ Marathon best of 1:15. In addition to being the personal coach to many outstanding athletes, Frank is also the owner of Fitness 121 Personal Training in Livingston. He is one of the few Coaches/Trainers to receive certification as an Endurance Performance Specialist from The National Endurance Sports Trainers Association (NESTA). Frank is also certified by The American Council on Exercise and The Cooper Institute of Aerobic Research in Dallas, TX. Visit his websites: TheRunCoach.com and Fitness121Online.com.